The International Monetary Fund (IMF) launched today its Regional Economic Outlook Update for the Middle East North Africa, Afghanistan, and Pakistan region (MENAP). 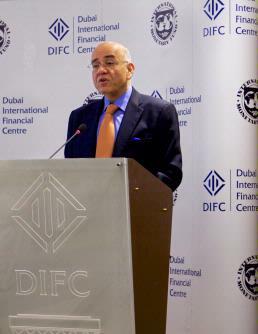 The Outlook was introduced in a press conference hosted by Dubai International Financial Centre (DIFC), a leading global financial hub, supporting sustainable growth in the Middle East, Africa and South Asia. The Outlook, titled “Middle East and North Africa: Defining the Road Ahead”, looks at the implications of the economic roads ahead for the Middle East and North Africa (MENAP) region against the backdrop of complex political, social, and economic transitions. Moving on from last year’s sluggish economic growth in the oil importers, a mild economic recovery is anticipated due to the scaling-back of hydrocarbon production amongst oil exporters. The update stressed that countries must not lose sight of the medium-term challenge of diversifying their economies, creating jobs, and generating more inclusive growth. According to the report, last year’s subdued growth in MENAP oil importers is expected to improve by 3 per cent in 2013, however this will not be sufficient to make sizeable inroads into the region’s large unemployment pool. Oil producers are expected to scale back the rate of production from an average of 5.7 per cent in 2012 to 3.2 percent this year. This is due to modest global oil demand; however, continued strong public spending is expected to support non-oil growth at comfortable levels in many of these countries. The IMF report also highlights the need for Arab countries in transition, still undergoing social unrest, impaired economic conditions, and complex political transition; to undertake difficult economic policy choices implemented in a socially balanced way. The event concluded with a panel discussion moderated by Yousef Gamal El-Din, anchor and host of CNBC’s Access: Middle East. Participants included senior economists and analysts from the region, namely Farouk Soussa, Chief Economist for the Middle East at Citi, Giyas Gokkent, Chief Economist for the Middle East at NBAD, Tim Fox, Chief Economist for ENBD and Masood Ahmed, Director of the IMF’s Middle East and Central Asia Department.